A contemporary restaurant exuding a vibe that is alive and inspired, 3in1 at Vida Downtown offers diners a modern and social Iftar experience with a modern twist. Spend your Ramadan in the heart of Downtown Dubai and immerse in urban flair as you get together with those that matter most for an Iftar that features delicious Ramadan favourites as you sit within aesthetic interiors or out by the pool. 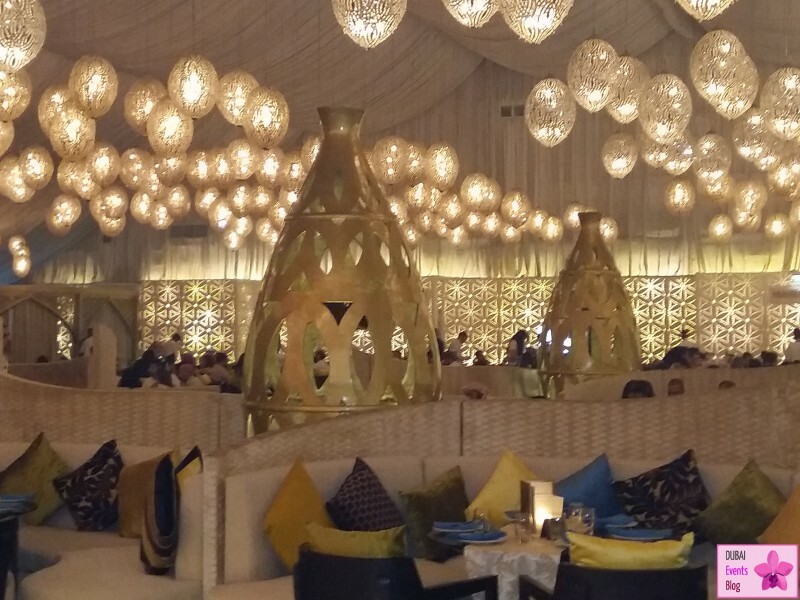 Grand Millennium Dubai hosted a special Iftar for the media and corporate clients. Atrium the beautiful international restaurant was the venue for this exclusive gathering that included top executives of companies and journalists from leading publications and electronic media. A tempting array of authentic Arabic delicacies awaited the guests. Included in the buffet were a selection of superb starters, main dishes, delicious fresh juices and mouth-watering desserts. The sizzle, crackle and aromas of the lavish spread liven up the exotic atmosphere. The extensive menu was enhanced with an equally sumptuous set-up that made for a unique ambience. Grand Millennium Dubai is a preferred venue for Iftar and Suhoor with exciting Ramadan Packages. Those booking Iftar for five or more in Atrium will benefit from the group rate, while banqueting packages for functions, with prices from AED135pp, come with a 20 per cent reduction if booked prior to the start of Ramadan – as well as a half price shisha menu. The hotel is also offering an Iftar buffet, open from 1800 hours to 21.30 hours, for AED135 per person, plus the Suhoor buffet between 2300 hours and 0400 hours in the lively Atrium restaurant – those booking a table for five only pay for four, while tables for 10 are charged for just eight places. Throughout the holy month of Ramadan, our spaces will feel like an extension of home. Hyatt Regency Dubai Creek Heights has dedicated Sufra, the hotel’s destination restaurant and Al Manzil, its most exclusive residential-style venue, solely to Ramadan. Sufra offers bright and contemporary interiors overlooking the neighboring Creek Park whereas Al Manzil reflects the ambience of a private mansion. This intricate setting features a dedicated entrance, swift valet service, dedicated prayer rooms and a large lounge for gathering and connecting, all ultimately leading to a collection of individually styled dining rooms and two interactive open kitchens at the venue’s heart. Hyatt Regency Dubai Creek Heights has again partnered with Al Jalila Foundation, donating one dirham for every Iftar meal bought. Al Jalila Foundation is a global philanthropic organization dedicated to transforming lives through medical education and research, founded by His Highness Sheikh Mohammed Bin Rashid Al Maktoum, Vice President and Prime Minister of the United Arab Emirates (UAE) and Ruler of Dubai in April 2013 to position Dubai and the UAE at the forefront of medical innovation. Zahira is the destination for Modern Middle Eastern Dining in Dubai, with a generous menu curated by award-winning Chef Greg Malouf. Everything from the food, perfumed cocktails, through to the soundtrack and warm interiors aim to elevate the diners’ senses, creating a complete Art of Dining experience. Expect high quality, home made tasting contemporary Arabic food for the Iftar set menu that changes each week.